The papers are from the November Key Ingredients kit. I am loving these papers from Fancy Pants Happy Go Lucky 6x6 paper pad in the November Key Ingredients kit. Have you checked out the Key Ingredients kit before? If not you are in for a special treat. You get enough cardstock, papers, and ribbon to make 16+ cards. It also perfectly coordinates with the stamp of the month....each and every month. You can also combine the two into a specially priced Deluxe subscription kit. CLICK HERE for all the details. I stamped the second row of lanterns by masking the first stamped row. I then colored the lanterns with Copics. I added some stitching, twine and a button to finish off my card. It is now time to hop on over to Carole Burrage's blog to see what wonderful project she is sharing today. 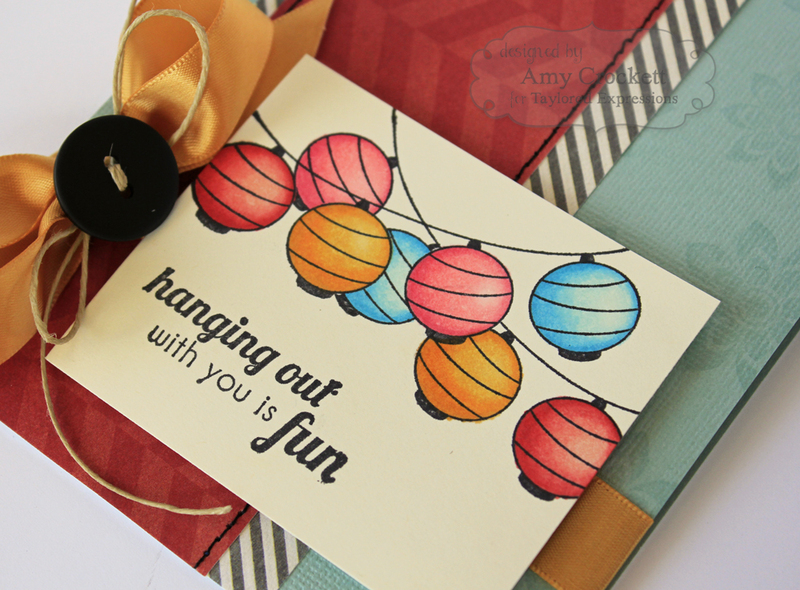 Your lanterns are gorgeous, Amy...such beautiful coloring and I love the pretty ribbon treatment!!!! Fantastic and gorgeous as always Amy! I was racking my brain with this set and you hit this baby out of the park out the gate. :) Great job! Beautiful, Amy! Love your masking! Amy, this is gorgeous! Love your layout and gorgeous colors!